A tub of fermenting kimchi. Bureaucrats stomp in where angels fear to tread. 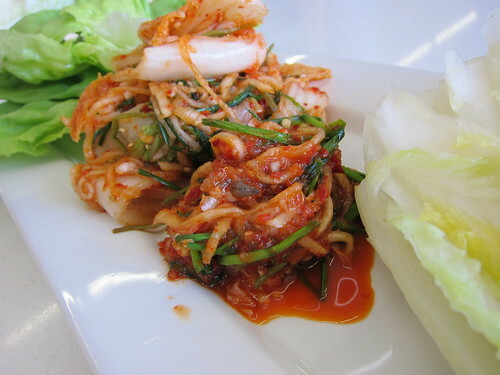 Health inspectors in New York City have recently cracked down on how kimchi is stored, penalizing many Korean restaurants with violation points and fines. Health inspectors view the fermented cabbage dish as a cold food, which means it must be stored below 41 degrees Fahrenheit at all times. The problem? That temperature is too cold for kimchi to properly ferment. According to The Korea Times, when Park Shin-soon, owner of Duck Hyang in Queens, tried to explain this to inspectors, he was slapped with a $700 fine. Business owners raised the issue with Mayor Bloomberg in October of last year. They're hoping that if they can prove kimchi's acidity is below 4.6, health authorities will loosen the rules for kimchi. They expect a response from the city later this month.